Museum 2.0: What is Twitter, Really? And Can it Do Anything for Museums? There’s a new 2.0 drug that’s caught on hot and heavy in the last six months: twitter. If you’ve never seen twitter, take a moment and check it out. There's the basic site. There's twittervision, twitter's most popular mashup, which shows tweets (twitter entries) real-time on a global map. And many more mashups and applications available here. And now, the first question in everyone's head: why the heck would I EVER want to follow this 140-character tripe? There are plenty of people on the "these ADD boneheads have finally gone too far" bandwagon (see this representative sample from USA Today), as well as some legitimate concerns about how twitter is the ultimate example of the way that 2.0's focus on networks and immediate connectivity erodes any hope for flow and deep relationships. But, hopefully, most people will get to the next questions: What is this thing, really? Is this good for anything? (For me?) There's a more measured article about twitter from the MIT Technology Review that gets beyond the hype to talk about twitter's functionality. Fundamentally, twitter is a service that "quickly matches new messages coming in from members with the followers who have signed up to receive them, then retransmits them using each follower's preferred channel: instant message, SMS, or the Twitter website." This means that you can broadcast messages to a group of friends/followers from your phone, your IM service, or the web, and can receive messages similarly. You don't need to have the same application open as someone else to communicate with them. No more dealing with one team member on AIM, another on gchat, one who thinks IM services are evil, and the fourth on the museum floor with a cell phone. You can reach all of them from the service of your choice, to the service of their choice. You can communicate easily with groups of people. Need to alert everyone on a project that the fire marshal is on his way, or that you just received the $50k grant you were hoping for? If not everyone is easily accessible by email, this is a good way to broadcast information to a group of folks. There is a stored, web-based record of your (and your networks’) actions over the time that you twitter. I’ve written before about the ways that internal blogs can be used to keep team members updated in a multi-party project. Twitter may be an even easier way to do quick updates, because the messages are short and the access points diverse. If it is adopted by a whole team, I think twitter can be quite useful internally for project management and group updates. But how could it be used uniquely for visitors in museums? Create a twitter profile for the museum and broadcast information about programs, events, and exhibits there. This is similar to initiatives where museums create MySpace accounts, in that you are going to “where the people are.” But it also can be used as a quick broadcasting system for the museum itself. My museum has a scroller on the web and in the lobby that update with information about hours, availability, and espionage facts; if we used twitter to load this information, it would be automatically archived, easy to distribute, and available to people who want to get it in other locations (i.e. to their phones or on the twitter website). Use twitter for automatic updates from exhibits on status and or evaluation. One of the more interesting mashups of twitter I’ve seen is for people who have developed computerized alerts from their home (when someone is at the door, when the fridge is empty, etc.). The SMS interface makes twitter a good application for these alerts. Imagine a “smart exhibit” that sends out an SMS alert each time it is used, each time a particular vote is registered, each time a button is hit, each time someone stays for X amount of time. If each exhibit had its own twitter account, it could automatically generate a web-based archive of its use and abuse. 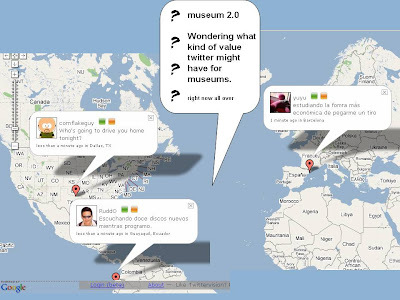 Create a twitter map mashup of the museum and combine staff, automatic, and guest tweets to generate a dynamic, real-time view of what’s happening at the museum. 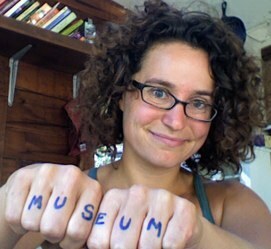 This can be used to do some of (1) and (2) and would convey action and excitement on a museum homepage or in the lobby. Wow! They are dropping eggs over there! Someone just made a bubble as big as their body! When I look at twittervision, I am entranced by the statements being made all over the world. If the map were just of the museum I was about to visit, I would be compelled and excited by the perception of action and interaction of folks and exhibits. Encourage museum visitors to link to each other through the museum network. Debatably the most “useful” current application of twitter is at conferences, where people meet others, join their twitter networks, and then can easily broadcast and receive information about great sessions, after-parties, and meetup opportunities. Twitter becomes a technological tool that enables real-time, face-to-face interaction between people who are running around the conference. Why not do the same for people running around the museum? There are many philosophical and emotional reasons to avoid or embrace twitter. Who really cares how the world responds to the question, “What are you doing?”? The answer is that we all do, selectively. How many phone conversations do you have that start with that question or some version thereof? When it comes to friends, family, and project team members, that question is often the glue that keeps people updated and on track with each other. Twitter is a tool with a specific functionality—it allows short-form communication across multiple platforms between groups and individuals. I believe that this tool, or something like it, points to the direction that communication via technology will go in the next five years, from platform-specific to universal. I should be able to put the word out—whether by paper airplane or keyboard—and get it where it needs to go. It’s each person’s individual choice as to how much emotional investment he/she puts into experiences with tools, whether those tools be the web, cell phones, or anything else. I used to hate cell phones. Now I appreciate the utility of having me be accessible rather than locations associated with me. I used to hate text messaging. Now I appreciate how much cleaner an interface it is than voice messaging. I'm trying to avoid both fear and lust with twitter. It’s worth knowing how these tools work and taking a non-emotional tack towards imagining how they might be used. Then, if the tool comes out well or poorly on balance, evangelize or slam it all you want. "cross platform, party-line text messages". Sometimes I want to blast a text message (cell, IM, email) to a group of people, no matter where they are or what platform they are using and Twitter fills that gap. So what are the file size limitations of this Tech? Endless? Can e-mail messages be delivered through this network? How about graphics? If so this may actually have some merit. When this moves from people spouting meaningless blather and into sharing of useful info then I'll be impressed. I have created a simple mashup that reads pointing data of Jodrell Bank radio telescopes from Twitter feeds, and displays on a star map the corresponding areas of the sky under observation. Give each object in the museum a twitter account so users can friend it and receive casts of how fellow users are interpreting it though some means, most likely by using a replica of the object which is placed amongst others on an interactive surface/table where they can be placed in relation to each and the relation described or simply annotated. 1st order objects in a museum are the artifacts. 2nd order objects are the 'story' or 'rationale' behind their ordering and display. Users should to be able to play about and de/re-construct both of those in a very hands-on way. Hi Nina, I know I'm a year behind you all but as part of Project AMEP I've been discussing here (see the last post), we're thinking of using Twitter to post live updates from the Australian Museum Eureka Prizes awards nite dinner (these are described as the 'Oscars of Australian science' so they're pretty huge). Any tips welcome and I'll be blogging how we go (and yes, how long it takes of course). Wish us luck!